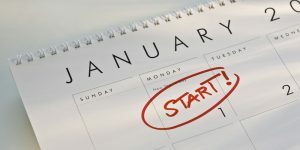 January is the month many of us are working on new year’s resolutions. We could be working on the same ones from the previous year or trying to make new goals. If you did not meet your aspirations for 2018, you are not the only one! According to studies over 80% of people fail or give up their new year’s resolutions by February! There are typically four reasons why we might not be following through with our new year’s resolutions and these are similar reasons to what we have written about on previous blog posts. One reason we might not be reaching our goals is because we are not making them clear enough. It is very important to clarify your goal before setting it. If there is a lot of uncertainty about what the goal is, this can create confusion, lack of interest or not feeling in sync with the goal itself. You should create a goal or resolution that is in step with who you are and what you want to reach. Another reason we might not be following through with a New Years resolution or goal is because we may be feeling overwhelmed. Change is not easy. If you try to do something too drastic it can put a lot of pressure on you to complete it. Pressure can also come from your friends, family, environment or culture. If you feel like you are trying to do too much too soon, take a step back and create easier, more manageable goals. Third, we can also be feeling discouraged from reaching goals. In relation to the second reason above, if a goal is unmanageable and we are not seeing progress – we can become impatient and give up easily. If we are faced with hundreds of hurdles the goal could not seem doable or desirable. It’s very easy to become ‘set’ in our ways, or comfortable with a routine. It can take a lot longer to change these ways than we anticipate. Give yourself enough time to manage! Finally, we simply might not be ready to change. We never get from point A to point B in a straight, linear line. We could be interested in making a change in our lives, but maybe we are not ready yet. If you are reading this or thinking of new goals, you probably do desire some level of change. We have to thoroughly consider what, when, where, and why we want to do these changes. If we are making too many excuses, the goals might not represent what we want to accomplish in the end. If you have any questions or concerns about setting and attaining goals for the new year, please contact us and we can help guide you!